If you wrinkle your nose or sigh with displeasure every time you look at the entry door of your home, it may be time for an upgrade. 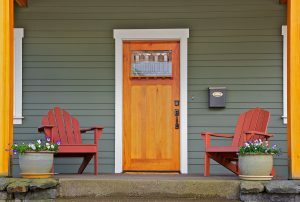 After all, your entry door is the focal point of your home’s exterior and if you’re not happy with it, why not change it? Of course, it often isn’t as simple as that because, as anyone knows, home improvement projects can be aggravating, take longer than expected, and be costlier than promised. Thankfully, in the greater Pensacola, Florida, area, there’s Majors Home Improvement. Established in 1997, we have spent decades helping homeowners beautify their residences with our premium entry doors. We promise to exceed your expectations and provide you with a positive renovation experience. It’s not a myth – our thousands of happy customers can attest to it! Our factory-certified craftsmen are committed to providing Red Carpet Service to our customers, ensuring they have an enjoyable remodeling experience with us. They will watch after your pets to make sure they’re not stressed out while they’re working, as well as make sure your home is cleaner than when they arrived. These are just some of the ways we go above and beyond for our customers. Plus, the installation you receive from our craftsmen will be unlike anything you’ve ever experienced. They won’t dawdle around, but get to work immediately and utilize the industry’s best practices to install your new door. They will also be friendly and helpful, always available to answer your questions. There’s no better company to trust for new entry doors in Pensacola, FL, than Majors Home Improvement. Let us prove it to you – contact us today to schedule a complimentary consultation.